Kat - Scientists at Bangor University in North Wales have found that different species of deadly viper snakes, tailor their venom to a particular prey. Knowing about these venom variations can help save lives as anti-venoms developed for one type of snake may not actually work for another. We sent Planet Earth podcast presenter Richard Hollingham to meet researcher Wolfgang Wuster who introduced him to the beautiful but deadly Saw Scaled Viper. Wolfgang - The saw-scaled vipers do make a noise. When they're annoyed, they curl themselves up into a figure of eight or pretzel-like position and rub their body coils against each other and that produces a hissing or rubbing sound which is really quite characteristic. Richard - I don't want to put my microphone too close to this, given that - whoah! That's quite frisky! Wolfgang - Don't worry, that's nothing. Richard - Now you're manoeuvring the snake within the aquarium here and you're using very long tongs to do this. So that noise was the scales rubbing against each other. Wolfgang - Yes. It's their trademark defensive behaviour. If they get upset, which happens quite easily, then they coil themselves up into this kind of pretzel-like figure and rub the scales against each other while inflating themselves with air, and you get this slightly hollow sounding hiss. The hypothesis is that this reduces their water expenditure which is what they would have if they hissed by breathing in and out like most snakes do. Richard - This latest research has been conducted by Axel Barlow. He's found that the type of venom these vipers produce is adapted to the prey they eat. Axel - In these snakes, some species feed on vertebrate prey like mammals and lizards, which is quite typical food for snakes, whereas different species eat quite unusual prey. Scorpions or centipedes. We found that the variation in venom composition is down to these differences in prey, so the species that eat scorpions and centipedes have a venom that's specifically adapted to feeding on that type of prey. Richard - How did you do this research, other than carefully? Axel - First, we looked at the diet composition of these snakes because often, real solid ecological data on snakes, such as what they actually feed on the wild is quite scarce. So we have to dissect hundreds of preserved museum specimens and that allowed us to demonstrate clearly that there was variation in the types of prey consumed. We then reconstructed the molecular phylogeny of the snake. Richard - So really, you're putting together an evolutionary tree of the relationship between the different species, different variations in the snakes. Axel - Yeah, that's it exactly and by having this evolutionary tree, that can form a framework for us to test our hypotheses. So through establishing the variation in diet, we could then test the toxicity of venoms to a natural prey item, which in this case, we chose a scorpion. By mapping the data of venom toxicity and diet onto the illusionary tree, we showed that changes in diet in the evolution or history of these snakes have been accompanied by an increase in venom toxicity to scorpions. Richard - Wolfgang, in terms of evolution, why do you think this is? Wolfgang - Venom is expensive stuff. It costs the snakes a lot of energy to replenish their venom reserves after they've bitten the prey item. So, for snakes that have more or less specialised diets, it makes an awful lot of sense to produce a venom that is of high toxicity to that prey so that they would only need the small amount to actually kill it. Richard - Are there implications of this research in terms of treating snake bites? Wolfgang - In the long term, we would hope so. Variation in venom composition is a ubiquitous phenomenon in snakes, and it's of great relevance for the treatment of bites. So this snake that's sitting behind Perspex here is a West African oscillated saw-scaled viper, the one in the cage underneath is Pakistani saw-scaled viper. 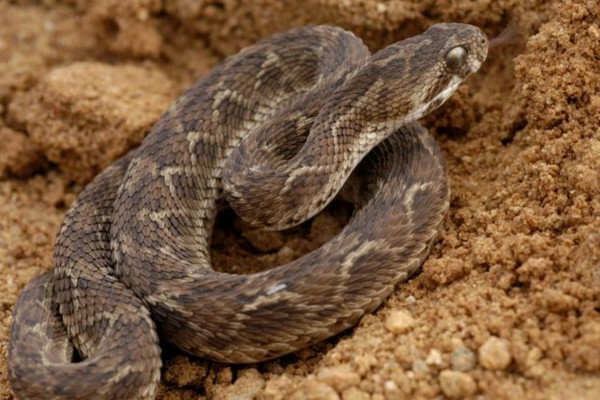 Now if you were bitten by oscillated saw scaled viper and you've got a specific anti-venom for that, you would have every chance of recovering and walking away from it. If you were to be given an anti-venom against the Pakistani saw-scaled viper, you would have a 20% chance of dying. And sadly, that's actually happening nowadays because African countries with access to fewer and fewer anti-venoms are now buying anti-venom in from countries like India and Pakistan, and it turns out, they don't work. So many people are dying needlessly as a result of that. What our research does is it starts to look at why we have this amount of variation in venom composition, and we're taking this further, and we're looking at the genetic mechanisms of that. So hopefully in the long term, it may allow us to predict which snakes are likely to have different venoms and which different venoms we may have to include in an anti-venom when we design one for a particular area. So in the long term, we would hope that this would have a beneficial impact. Kat - That was Wolfgang Wuster and Axel Barlow from Bangor University's venomous snake facility, ending that report from hopefully still alive, Richard Hollingham.